Arthur Godfrey redefined the role of radio announcers, bringing a warm, friendly, and folksy style to announcing that stood in contrast to the strict formality of many announcers. He was well-known as a morning talk show on Arthur Godfrey Time (which continued even after the golden age of radio had ended.) His human touch made him a winner with audiences, perhaps most notably his emotional reaction to the funeral procession of President Roosevelt. In addition, he was noted as the host of Arthur Godfrey’s Talent Scouts, which quickly became America’s most popular amateur program. Few men landed on as many detective shows as Les Damon. He was Nick Charles in the Thin Man, The vast majority of existing Falcon recordings feature Damon. He was also Inspector Mark Sabre on ABC’s Mystery Theater, the second Pat Abbott in NBC’s Adventures of the Abbotts, and the last Captain Kennelly on 21st Precinct. He also worked in the daytime soaps, starring in the The Right to Happiness. In addition to this, Damon made appearances in the Sci-Fi Anthologies Dimension X and X Minus One. John Dehner had only one series lead prior to 1958. In 1958, he starred in two programs. In February, he began in Frontier Gentleman and that ended November 16th and on November 23rd he played Paladin on radio’s Have Gun Will Travel and would remain for more than two years. Dehner also starred in CBS 1952 Mystery program The Judge and auditioned for the lead in Fort Laramie. However, Dehner’s career was ultimately defined by the countless hundreds of character roles he played from Philip Marlowe to Gunsmoke and Lassie. Dehner’s deep voice resonated with radio audience regardless of where it was placed. When Rod Serling made Zero Hour, the first of several radio revival attempts in the 1970s, Dehner played the lead role in the first series. Ripley’s Believe it Or Not was perfect radio. For 18 years from 1930-48 Ripley brought radio listeners weird facts and oddities from around the world. Ripley took full advantage of radio’s theater of the mind as in longer version, dramatic re-enactments of the strange but true stories would be done, much to the delight of radio listeners. 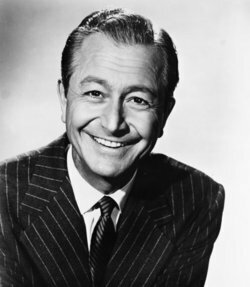 Robert Young was best known as Jim Anderson on Father Knows Best which got its iconic start over radio in 1949. However, he was far more than that. As a film actor, he appeared in 100 films. Over radio, he took on countless roles in a variety of genres. He appeared frequently on the Lux Radio Theater. He was a host of Maxwell House’s popular variety show The Good News of 1939. He appeared on Suspense and of course, The Family Theatre. Young also hosted two radio dramas for the Episcopal Church in the late 1950s and early 1960s called The Witness and The Search. Throughout his career, he remained one of America’s best loved entertainer and his long radio resume reflects that.